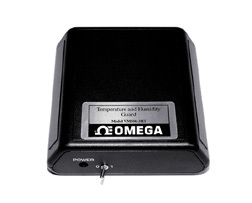 Model OMA-VM500-3HT is a full-featured monitor and alarm system that monitors temperature and relative humidity and power status wherever the unit is located. These systems can dial up to four phone numbers, and the integrated voice tells you the temperature and percent relative humidity levels and whether the power is on or how long the power has been off. You can also call the unit at anytime and hear a status report that gives you an update on the conditions at your facility. The OMA-VM500-3HT is easily programmed over the phone. Simply locate the unit in the area where you want to measure the temperature and relative humidity. Plug in the phone line and the power adapter and turn the unit on. Call the unit from another phone or cell phone and follow the spoken instructions to program the temperature and humidity limits and the emergency phone numbers. The system is now programmed and is monitoring temperature, relative humidity and power at your facility.